TreeAnnotator is a program to summarize the information from a sample of trees produced by BEAST onto a single “target” tree. The summary information includes the posterior probabilities of the nodes in the target tree, the posterior estimates and HPD limits of the node heights and (in the case of a relaxed molecular clock model) the rates. 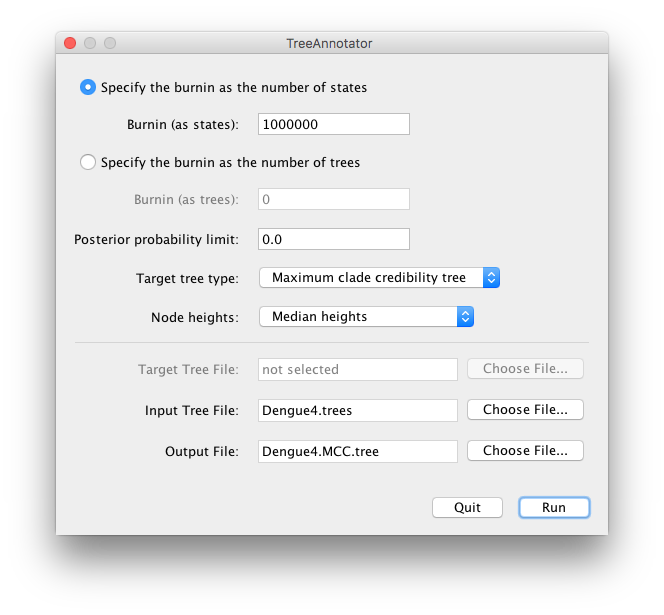 TreeAnnotator is a program to summarize the information from a sample of trees produced by BEAST onto a single “target” tree. With this option you specify the number of states in the MCMC chain you wish to discard as a burnin. This will be irrespective of the sampling frequency. In this case you just specify the actual number of trees you wish to discard rather than the number of states. Posterior summaries will only be calculated for the nodes in the target tree that have a posterior probability greater than the specified limit. This is a way of removing summary statistics from nodes with very little support where these may be unreliable. If you select the Maximum clade credibility option then the node height and rate statistics will be summarized on the tree in the posterior sample that has the maximum sum of posterior probabilities on its n − 2 internal nodes. See this page for a description of the MCC trees and various other summary trees. If you select the “User target tree” then the tree statistics will be summarized on a user-specified tree. This option allows you select how the node heights are summarised on the target tree. You can choose to keep the heights that the target tree has, or rescale it to reflect the posterior mean/median node heights for the clades contained in the target tree. This option allows you to select and input the target tree. This option will only be available if you have selected User target tree from the Target tree type combo menu. This option allows you to select the input tree file (the tree file produced by a BEAST analysis). This option allows you to specify a new file that the summarized tree file will be saved to. Ignoring first 1000000 states (1000 trees). Finished - Quit program to exit. TreeAnnotator will state the number of trees that have been read, will find the best fit tree specified under the “Target tree type”. The progress of this will be monitored by the * symbols moving across the screen. When the program says ‘Finished’, the annotated tree file will have been written. Close the program by selecting the Quit option. The tree file can then be displayed in FigTree. -forceDiscrete forces integer traits to be treated as discrete traits. The last two options are specific to summarising trees with discrete and continuous trait values and will be dealt with elsewhere. Just typing treeannotator with no additional options will bring up the user-interface dialog box.